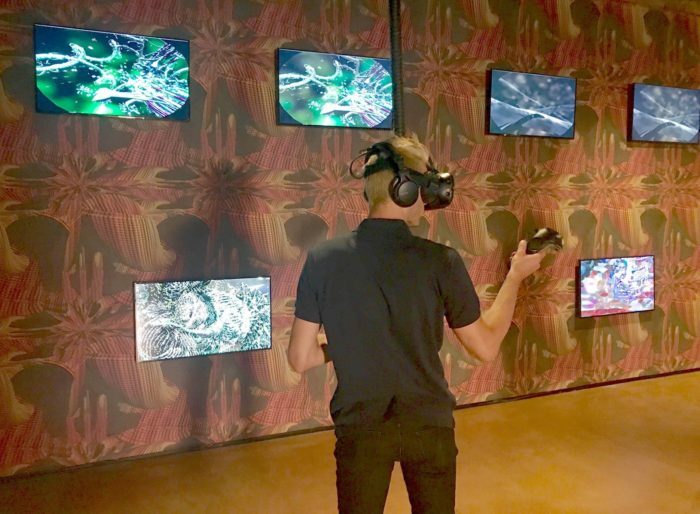 Digital and augmented art, as well as artistic virtual reality slowly start to spread at the Venice Biennial and across the city of Venice. 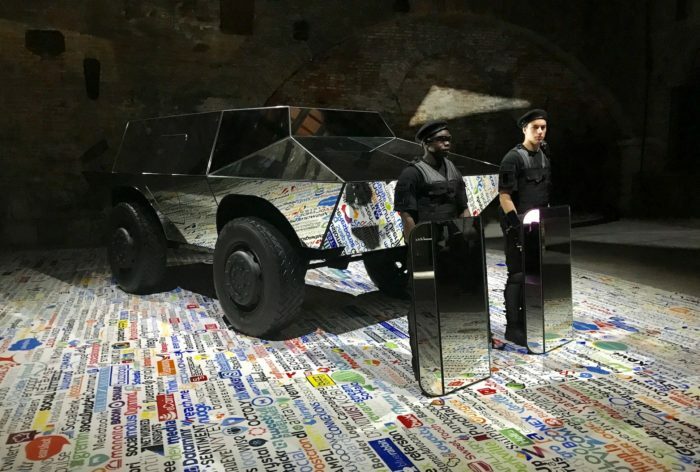 There is an augmented reality piece by The Recycle Group at the Russian Pavilion, the Hyperpavilion at the Arsenale, with works by Guan Xiao and Cao Fei, the exhibition “HYBRIS—Hybrids and Monsters in Contemporary Art,” and virtual reality works by Paul McCarthy, Christian Lemmerz and Dropstuff throughout the city. 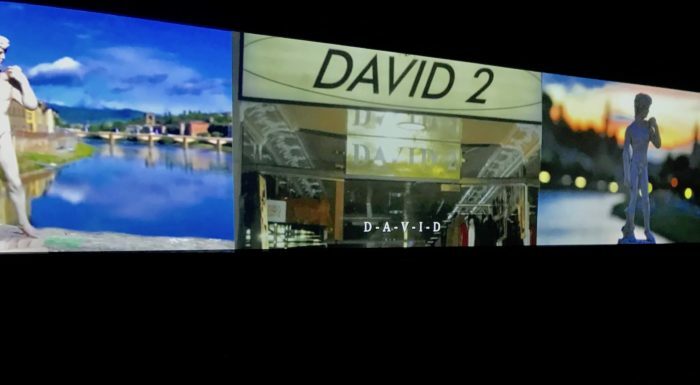 Two of Cao Fei’s video works are included in the show Space Force Construction – Contemporary and Soviet Art in Dialogue, organized by V-A-C Foundation in the Palazzo delle Zattere. 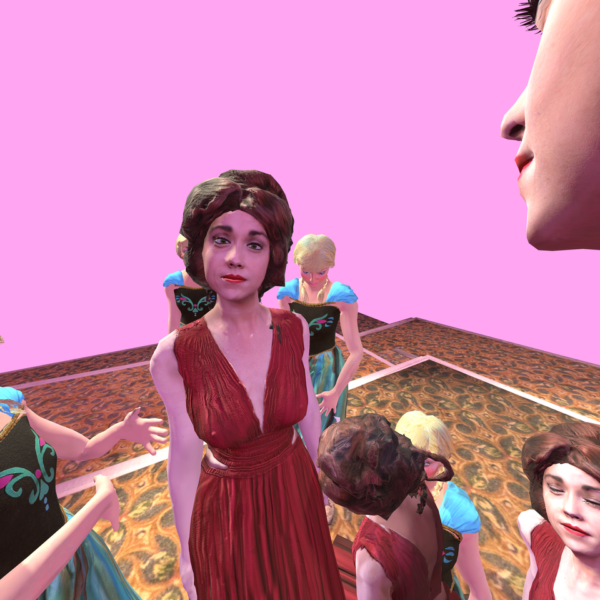 The exhibition gathers nearly two dozen artists whose works deal with questions like “What thoughts or actions can art demonstrate, for which publics and in what spaces of display?” Chinese artist Cao Fei places Marx, Mao and Lenin together in the online virtual world Second Life, where they live a utopian existence in the contemporary sense of the word. 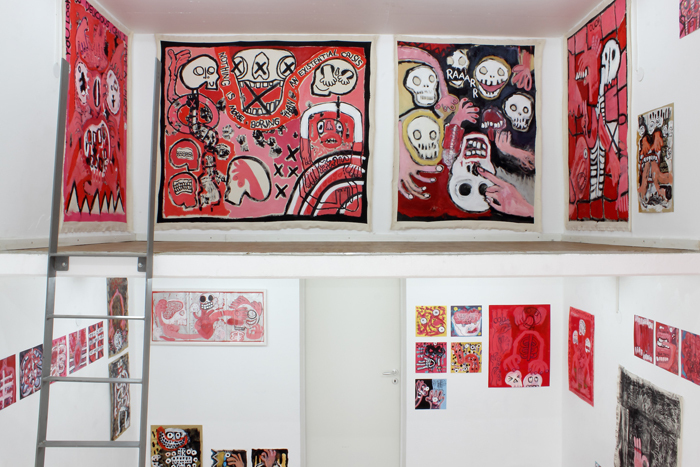 Read more about the exhibition here. 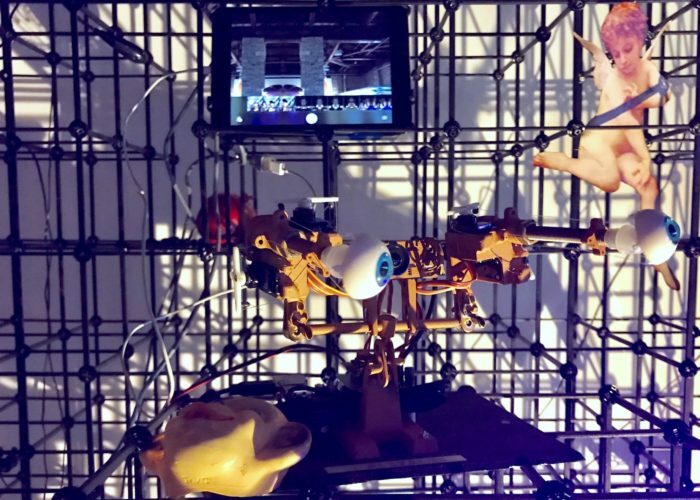 The Recycle Group presents an augmented reality installation at the Russian Pavilion. Out of geometrical 3D forms on the wall and the floor parts of human-like figures appear, resembling a contemporary rectangular version of Michelangelo’s Prisoners and Slaves at Academia in Florence or maybe even Quayola’s Captives. 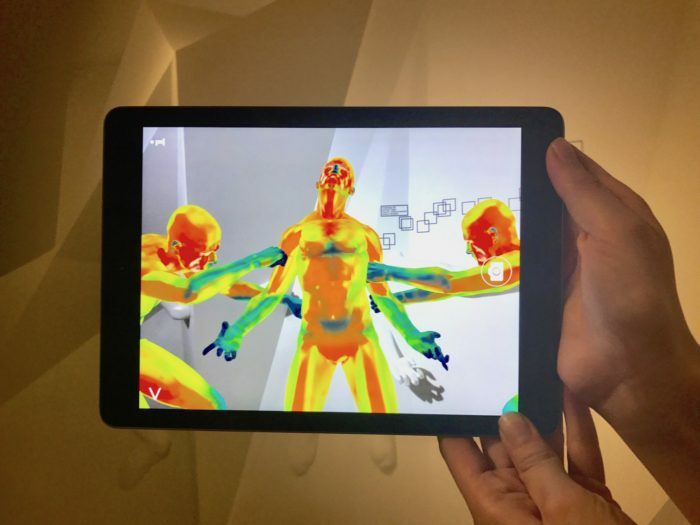 However, through a tablet or smartphone with a special app, naked human male figures in dynamic poses appear in a thermal image aesthetics on the screen. 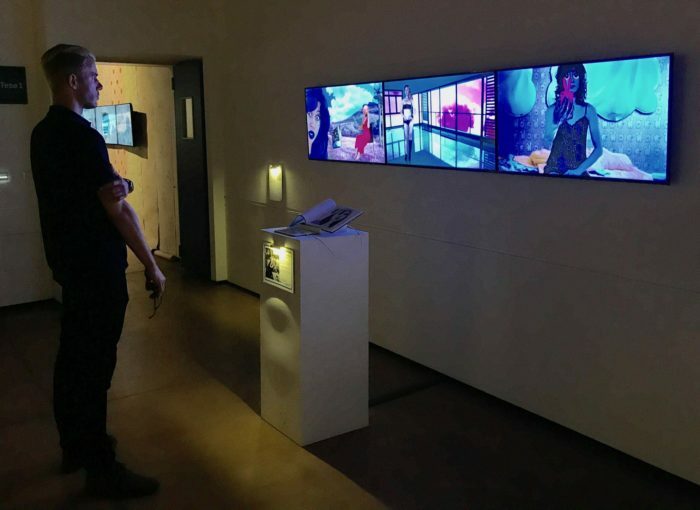 The exhibition “HYBRIS—Hybrids and Monsters in Contemporary Art” (Multimedia Exhibition) is curated by Silvia Burini, Guiseppe Barberini, Anna Frants and Elena Gubanova and organized by CYLAND International Media Art Lab at Ca’ Foscari Zattere in Venice. Carla Gannis’s project A Subject Self-Defined, here installed as a three-channel video installation, is a huge project of Selfie Drawings that also exist as digital drawings with augmented reality versions. 52 complex images embed the virtual self of the artist into different narratives, reflecting contemporary topics of the digital sge and art historical references, drawing up a fresh rebrand of women’s depictions in today’s selfie culture. Explosion of a Can of Condensed Milk after the Water has Evaporated is a monumental media installation by Anna Frants with an open framework structure that conceptually references a computer grid. It houses images from art history, little robots with moving eyes, Ipads to take selfies with or sculptures. 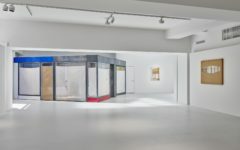 The spectator can (partly) interact with this bizarre agglomeration of things that encourages him or her to poetically reflect about the different versions of the self-displayed or mirrored here in the installation. 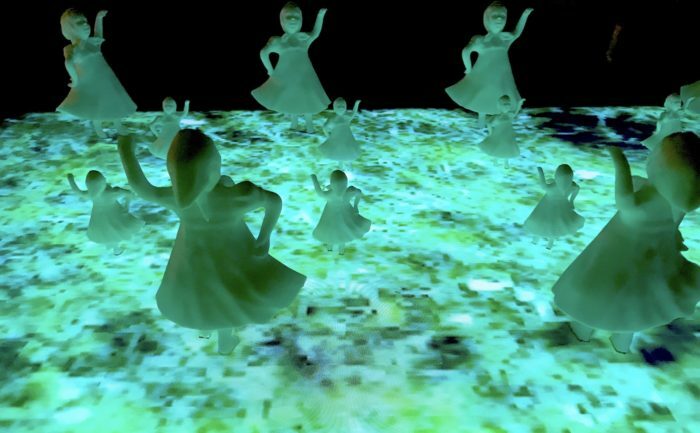 Pastorale by Ludmila Belova includes 3D printed figurines of shepherdesses on a screen with a pixilated video imitating a flowery meadow. The sounds derive from music by Jean-Baptiste Lully and electronic bird chirping. Artist William Latham presents the generative artistic VR experience Mutator. Synthetic organic forms randomly reshape and evoke the setting of an underwater reef with digital corals and little fishes swimming around. The VR user can attract them via glowing telephone cords (aka his HTC Vive controllers) and dive to the black ground of the sea. 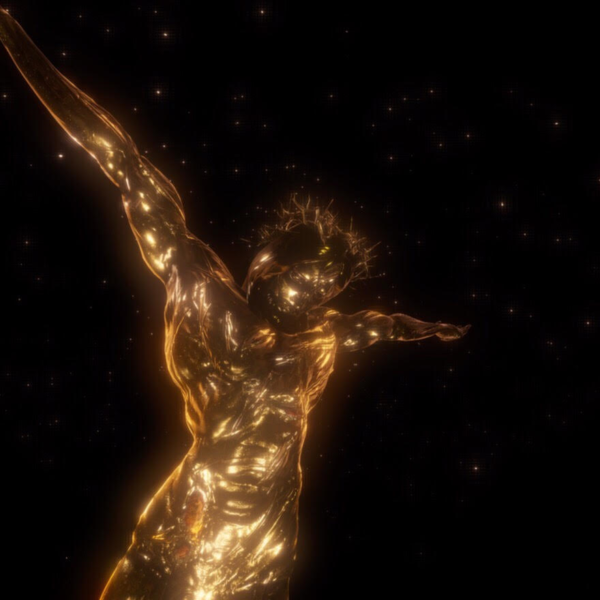 Further, he can shift endlessly between different versions of the setting—each slightly differs from one another. 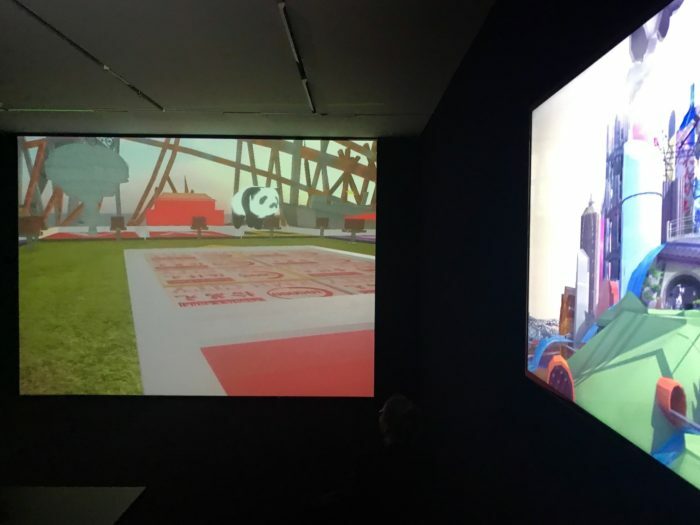 “The HyperPavilion seeks to explore the ways in which the digital and physical worlds have merged to create an entangled hybrid reality that encompasses us globally, and now offers a new aesthetic with new consequences and new organization,” as curator Philippe Riss writes in his statement. Aram Bartholl’s installation Weeping Angels shows a mirrored anti-riot police truck on a huge carpet with logos from internet marketing and user tracking companies. Two fully equipped, very serious-looking guards protect the vehicle with mirrored shields. The work “tries to capture the dark age we are about to enter, with ever growing surveillance, terror attacks and cyber-war accusations on a daily basis. While we drink our beloved cheap hot coffee and chill on our fluffy carpet at home thousands of companies retrieve and deal with our personal data, violating our personal rights”. (text taken from the accompanying guide). 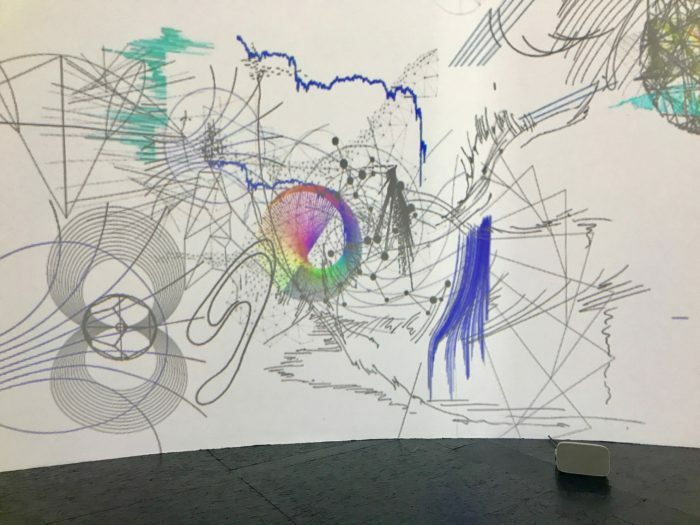 Claire Malrieux’s dynamic generative software drawing Climat Général is constantly self-evolving and ever changing. The artist uses imagery from meteorological phenomena, major human activities and the world of Gaїa, the Greek goddess impersonating the Earth. The images deal with the Anthropocene and they intertwine, superimpose or aggregate on the 360 degree panoramic surface of the installation. Theo Massoulier’s work Anthropic Combinations of Entropic Elements consists of a large number of small hybrid sculptures out of different, appealing, shiny or colorful materials. They resemble plants, minerals, rocks or tiny animals. Theo Triantafyllidis’s generative live simulation How to Everything combines elements like a rock, a little dinosaur, a smart phone, a watermelon, a hand or a plant in front of a landscape- like colored monochrome background. The elements playfully yet unpredictably interact which each other while being randomly sorted anew in this simulated environment. For more information please visit www.hyperpavilion2017.com. Christian Lemmerz, La Apparizione, 2017, virtual reality work / Copyright Christian Lemmerz and Khora Contemporary, courtesy the artist and Khora Contemporary. The Faurschou Foundation at San Giorgio Maggiore presents the exhibition New Media (Virtual Reality Art) with artistic VR experiences by Paul McCarthy, who usually is best known for his often nightmarish or obscene huge spatial installations and dynamic sculptures, and Copenhagen-based sculptor, film and performance artist Christian Lemmerz. 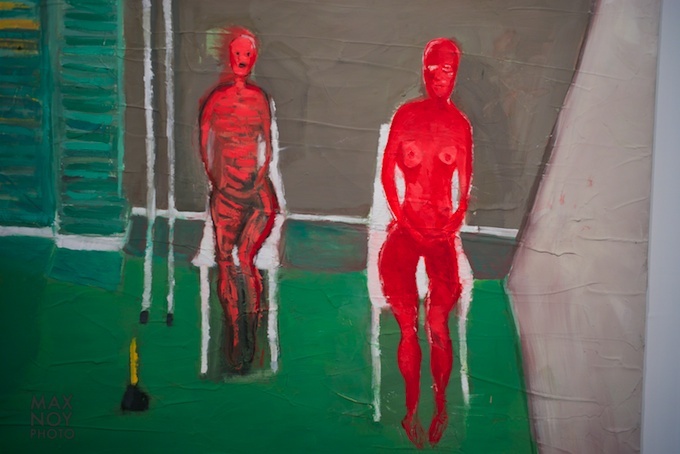 In his two VR pieces, McCarthy creates a cube-like space with (dressed) female figures floating around, dirty talking, intensely looking at the viewer (when he comes close). In one of the works, the walls of the space constantly move and float towards and into each other so that the viewer constantly finds himself in new versions of a steadily shifting cube in between the appearing and vanishing floating females. 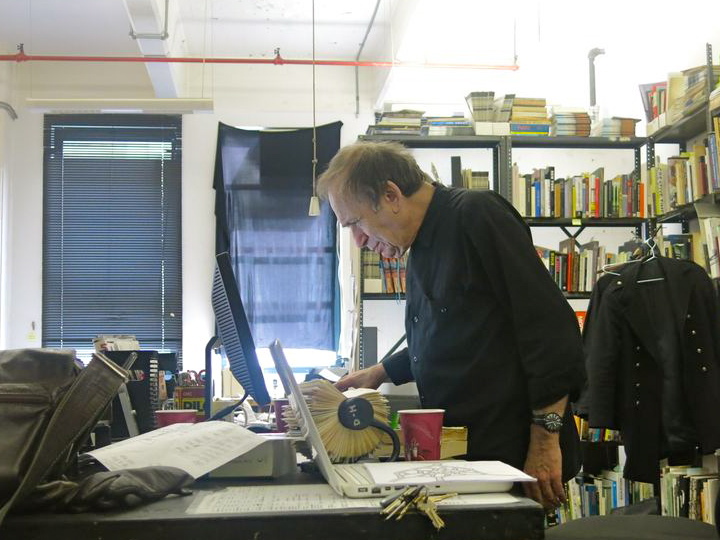 Christian Lemmerz’s work is very different. There, the spectator faces a golden yet suffering monumental Jesus nailed onto an invisible cross (La Apparazione, 2017). 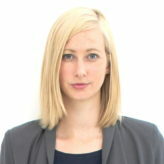 For more information and images on this show, please read Scott Indrisek’s article here on Artsy. 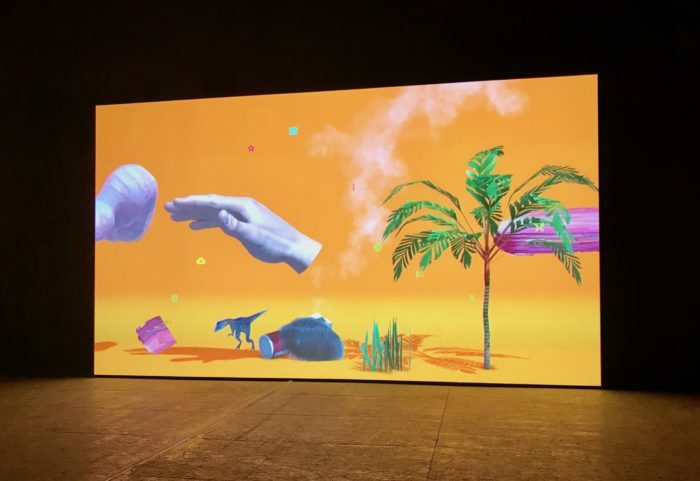 Nearby the vaporetto station Arsenale, the Dutch media art initiative Dropstuff that is specialized in creating public experiences, show The Fair Grounds, an interactive multimedia installation involving Virtual Reality. The location they chose is a public place on the street, where Biennale visitors, tourists, the occasional remaining citizens or crewmembers of the yachts nearby mix. 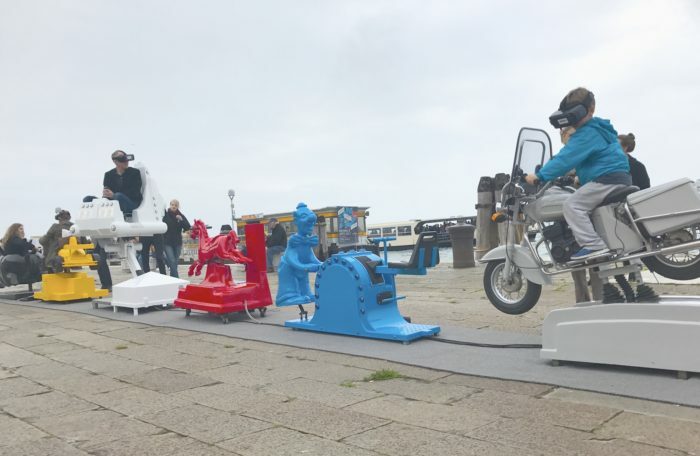 The installation consists of six nostalgic so-called ‘kiddy rides’ lined up like a train and colored in the template of De Stijl. The spectator takes a seat on one of the moving rides and wears a head-mounted display to then take a virtual high-speed ride through the cities of Venice or Amsterdam. 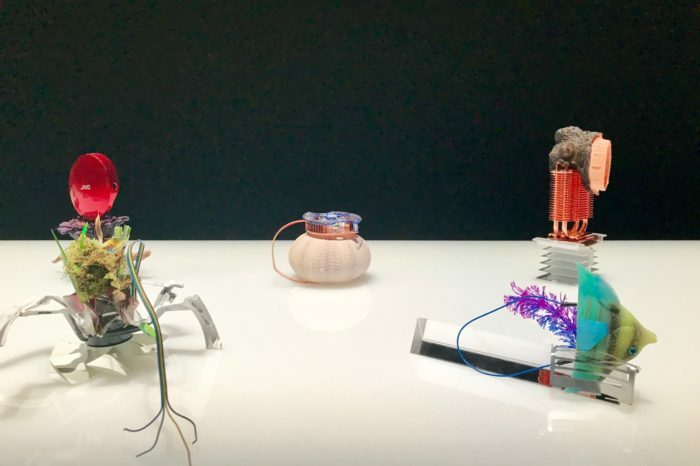 In their work, Dropstuff experiments to connect popular culture, technical innovations and artistic translations. “This in an attempt to search for ways of ‘inclusivity’ instead of ‘exclusivity’ in times of cultural and political polarization”, as media artist René van Engelenburg and media designer Gijs ten Cate state about their project.